Earlier this month, we shared a look into our finished kitchen renovation. But today we want to share how we decided on the design for our kitchen. We designed the entire home around our kitchen because it truly is the heart of our home. Our kitchen is in the literal center of the house; it opens up into the great room to the south, dining room on to the east, and is the main gathering point in our home. With our kitchen as the focal point, open concept was the only option for us. 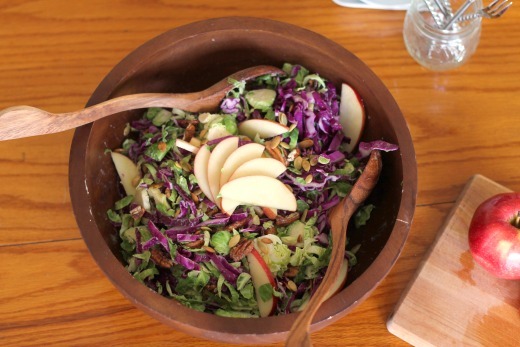 As food bloggers, we are constantly creating and testing new recipes. We wanted a kitchen that would have the ability to handle the high volume of cooking and baking we do, while still having enough space for guests. Everyone always gathers in our kitchen and we wanted there to be enough room for everyone to be comfortable. 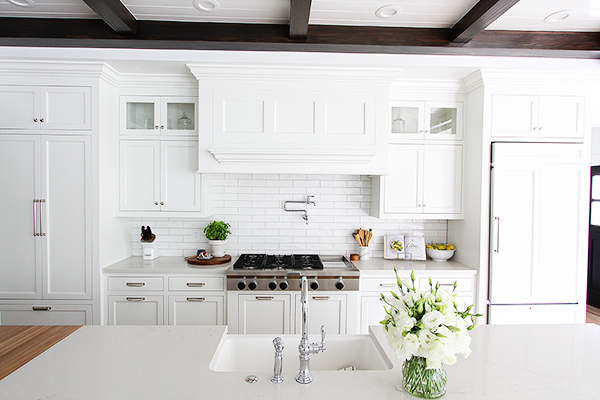 We chose a white kitchen because we like a clean and classic aesthetic. It is also a great background for our photography and videos. As we designed our kitchen, it was important for us to think about the flow and how to optimize our space. We carefully thought about where each and every appliance should go. We have two large islands that are 10 feet long and about 4 feet wide. We love having all of the countertop space! Our first island is home to a sleek and beautiful integrated butcher block. We like the detail the wood block adds to the kitchen and we also like having an extra space for chopping, cutting, dicing, and slicing. 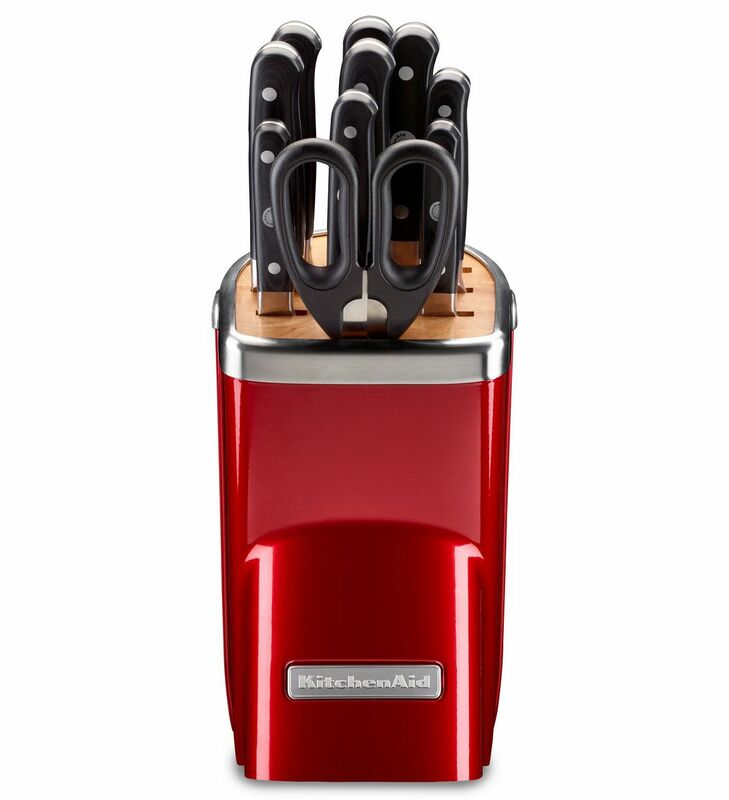 We keep our KitchenAid® 11pc Professional Series Cutlery Set close by so we are ready to go for all of our favorite recipes. In the center of the first island, there is a large farmhouse sink surrounded by two paneled KitchenAid® Dishwashers. When one is full, we load the next one. We love how quiet the Dishwashers are and the dishes come out sparkling every time. Our second island is “appliance row!” This is where all the fun happens. 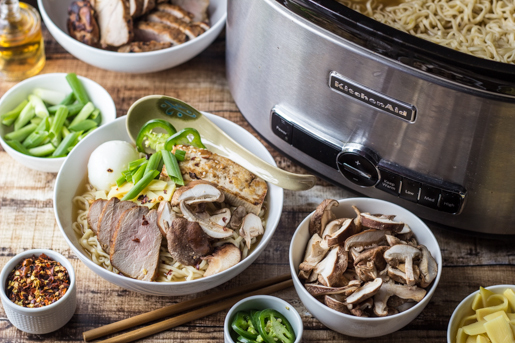 Starting with the KitchenAid® Ice Maker, which holds 25 pounds of ice. We have a small farmhouse sink next to the Ice Maker so it is easy to get a cold glass of water. We also use this sink for prep work and hand washing. 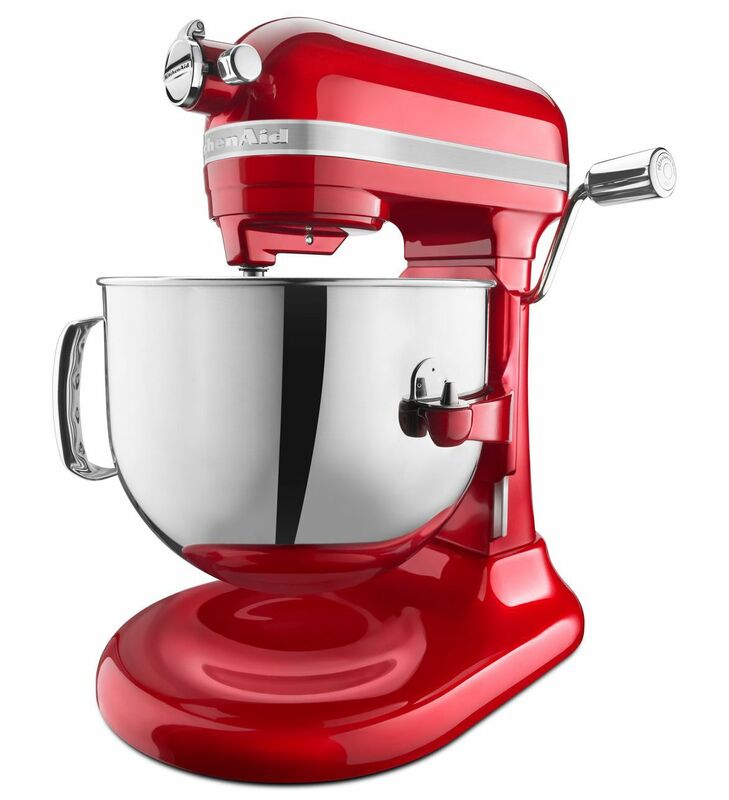 We chose KitchenAid appliances for many reasons such as quality, ease of use, and style. But, we also chose them because they truly make our kitchen into a gourmet one – like these KitchenAid® Refrigerator/Freezer Drawers. They are paneled, so no one even knows they are there, and we love the extra storage space they provide. On this island, we have counter stools for our guests to sit and relax while we cook them dinner. We also use this seating for casual family dining. 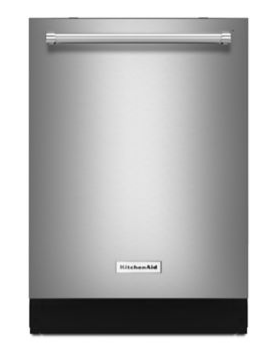 Next to our Refrigerator/Freezer Drawers is our KitchenAid® Built-In Microwave which we use on a daily basis. We like the sleek look of having it in the island. In the middle of our kitchen we have a baking station where we keep flour, sugar, oats, and our KitchenAid® Stand Mixer. 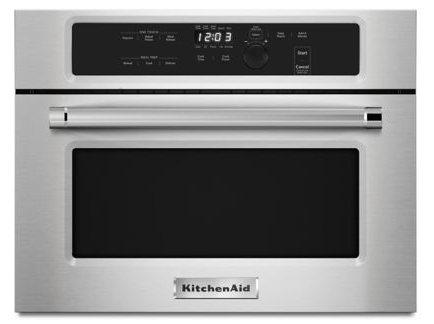 On one side of the baking station, we have our KitchenAid® Double Wall Oven and Warming Drawer. 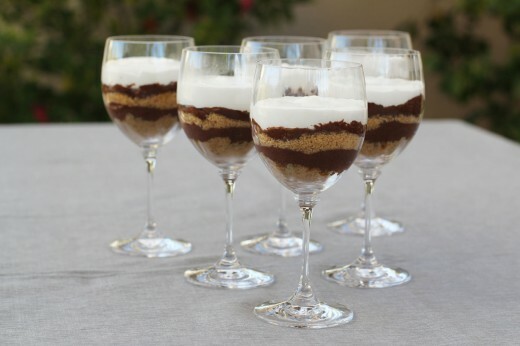 We love having two ovens, especially during the holiday season when we are baking and entertaining almost every day. The Warming Drawer is nice for proofing dough, slow cooking, and warming plates. 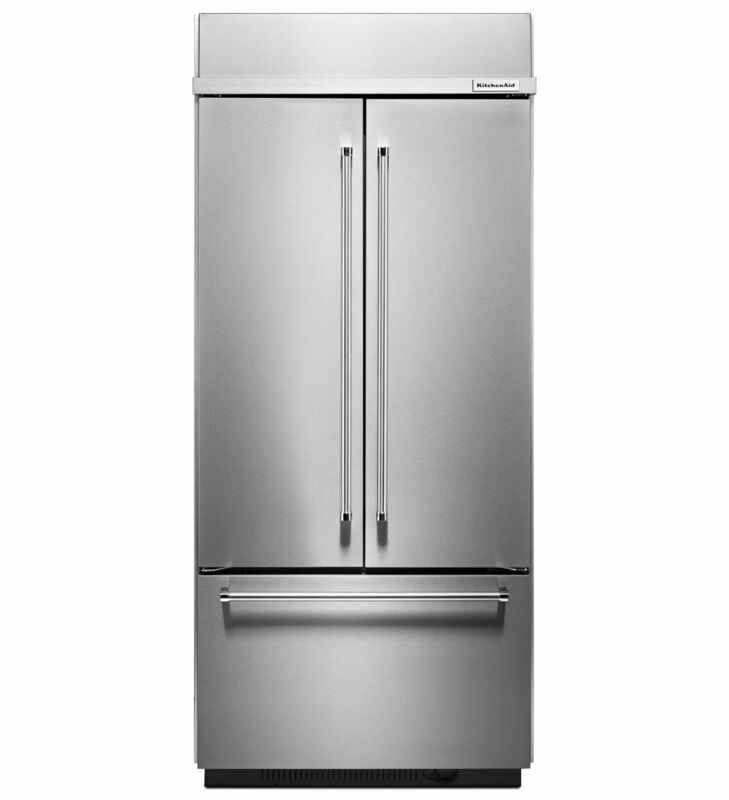 On the opposite side of the baking station, we have our KitchenAid® Built-In French Door Refrigerator. We love the French doors because it makes it easy to store platters and trays for entertaining. On the north wall of the kitchen, we have a KitchenAid® Gas Rangetop with an integrated griddle which is great for making pancakes or just grilling up a sandwich or quesadilla quickly for our boys. 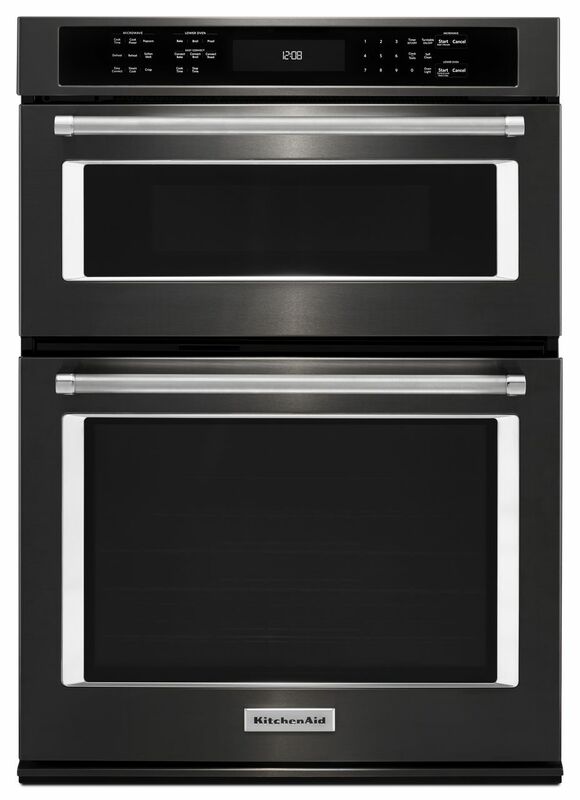 Above our rangetop is a KitchenAid® Custom Hood Liner, which is perfect for controlling those cooking fumes. 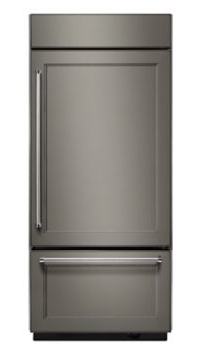 Just to the right of the Rangetop, we have a KitchenAid® Built-In Bottom Mount Refrigerator. A lot of people keep an extra Refrigerator in the garage or basement, but we designed our kitchen to house two Refrigerators so we wouldn’t have to go far to get to our second Refrigerator. The extra space is nice and we love that the Refrigerator blends into our cabinetry. We are beyond happy with our KitchenAid kitchen; it’s our happy place and we love that we can share the finished product with you!